In non-fashion related news, I did something funny recently. Yesterday, Toronto had a little taste of Montreal-winter. It was cold and it snowed and Toronto had a melt down. Everyone freaked out, traffic was ridiculous and the weather was THE topic of conversation. It was -16ish, (baby food for a Montrealer like myself) and yes it was nasty and yes everyone had to pull out the parkas, mitts and beanies and yes it was uncomfortable but WHATEVER it's Canada. All this to say that once I made it through the storm** and got to the office (I work for the Ryersonian now woohoo! Final year internship!) I was pulled aside by the RyersonianTV manager and told that I had 15 minutes to prepare a script because I was the day's weather girl. And the Weather Girl award goes to....anyone but Elayne. AND THIS IS WHAT HAPPEND..... pure awkward elayne-style improv... how embarrassing. There are so many things wrong with this newscast. It's kinda really funny. Enjoy! 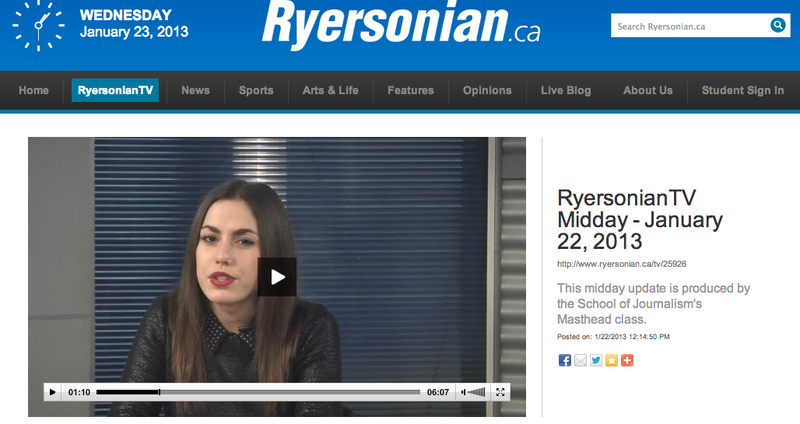 http://www.ryersonian.ca/tv/#.UQAkwM73dHc.blogger Click on the January 22, 2013 video. Camera caught my death stare. As usual. Issey Miyake - Pleats Please? Yes Please!